As Blockbuster says goodbye to an era of Blockbuster nights, it's going out with one last laugh. The store chain shared its final movie rental on Twitter Monday, and the customer - who checked out the title from a Hawaii Blockbuster location on November 9 - picked the appropriately titled comedy, "This Is the End." The well-reviewed summer flick starred a near comedy club of actors, including Seth Rogen and James Franco, as a group of friends who, during a rager at Franco's house, find that the world has descended into apocalyptic chaos. Rogen, who also co-wrote and co-directed the comedy, got a little nostalgic after seeing his film being named the final Blockbuster rental. "This is nuts and sad," the 31-year-old tweeted. "In high school I would go hang out at Blockbuster every day." Yet come January, high school-aged kids will no longer be able to use their local Blockbuster as a meet-up spot. The remaining 300 stores in the U.S. are being shuttered by the DISH Network, which bought the company in 2011. ... but I'll never be able to delete that useless awful Blockbuster app from my phone. can you believe that they just opened a video rental store near my house? Frum muh cold, dead hainds....yuuuuuuup! Remember that video store skit on the Amanda Bynes Show many years back? The staff always tried to sell homemade rip-offs claiming, "This one's better! MUCH better!" yeah... I "went to blockbuster" just about every day when I was in HS too. It was a great excuse to go on a burn run and not be back right away. We haven't had a blockbuster store in my area of Virginia for years! They all pretty much went away when redboxes started appearing. What are they going to do about the freestanding redbox-like things they have? Anybody read anything about those? There's still a couple of those around in my area. Or was that actually the amanda show before she became insane? "Blockbuster Express is a movie-rental kiosk brand sublicensed for use by Redbox from licensee NCR Corporation. 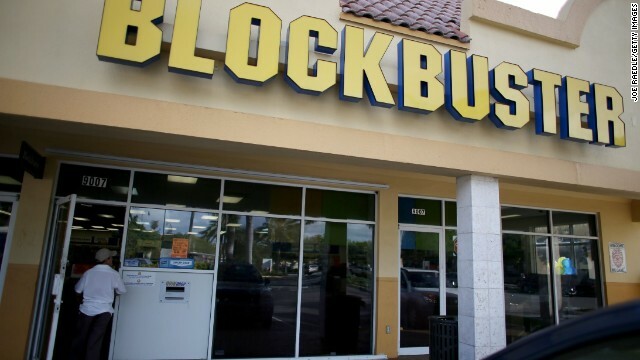 [....] Apart from the license to use the Blockbuster brand name, Blockbuster Express kiosks are unrelated to Blockbuster LLC"
This is the End sucked so bad I want to sue someone for that period of my life I lost and will never get back. Mel Gibson in, The Last Blockbuster! WRONG, wrong, wrong. Blockbuster still has stores open in Alaska ! Kealani – the remaining 100 or so Blockbuster are franchise stores. Dish is closing all CORPORATE stores. Take the last train to Clarksville,And I'll meet you at the station. You can be be there by four thirty,'Cause I made your reservation. Don't be slow, oh, no, no, no! Oh, no, no, nooooooooooooooooooooooooooo! So if he checked it out, and they were closing the store...did he get to keep it? Or, just PR stunt. My last movie I returned on the 9th was 'Now you see me', also appropriate. My question is where do I go to rent a movie now if I need to get it right then and there? Netflix and many of the other online movie sites many times don't have the selection of movies I want. Also, I prefer to play movies on my DVD not computer. So, it beggs the question, where do I go now? I would recommend going to 2013. They have things to assist in these situations. These days you don't need a Blockbuster. Netflix has its DVD service, but yes, you have to wait a day or two. If you absolutely need it tonight, go find a RedBox or the like. Redbox or just buy the movie. They're not that much more expensive. honestly if you have cable or sattelite service their ppv is just as good as any store rental service. Also, Blockbuster is not the only video rental company around. If Netflix doesn't have it, you need to buy it. Many Blu-ray players will play various video-on-demand services like Amazon, Netflix, and VUDU. That's where I get mine. When buying one, be sure it offers the service(s) you want, and has built-in wifi if you can't run a network cable to it. You can always rent movies from a pirate that lives in the bay like many other people do. Get a smart tv or a blue ray player with built in wireless. Many of these have Netflix as an app. The one I have has Netflix, Vudu (wallyworld's video service), Amazon prime, and Hulu. Dude, Jenkins, you realize it's still 2013 right? Lay off the smoke, mmkay. It's starting to build up, and frankly, it stinks. What color is the skye in your world? U R delusional. And a troll. No wonder they bit the dust. Dish Network bought them. Look for Dish Network to go away within two years. They have been dying on their own, with the high late fees and hefty prices; they dug their own grave. Dish tried to bring them back, or at least have a movie rental within their name. Blockbuster was cheap and had enough movies to be content with. This has been mentioned in EVERY article about the closures (including those on CNN prior to this one). Franchise stores are NOT closing, but the vast majority of stores are. All "corporate stores" i.e. those owned by Blockbuster will close. It has been a sort of game to find one here in Texas with my family. So far only one has been found within our area, and even that one will close down. I wonder if he had to return that rental? Not only did he have to return the DVD, they charged him an extra $1.00 because he forgot to rewind it. Don't ya hate it when they don't rewind your DVD? Lol!